This project originated from a customer asking us advice on the experimental design for accomplishing an Insertion by Site-Directed Mutagenesis. Their goal was to insert the large repetitive 10xHis Tag in their protein of interest (STb). Their previous attempts had failed. Their plasmid actually codes for a pMAL-STb fusion protein. The researcher’s lab is located at the Faculté de Médecine Véétérinaire de l’Université de Montréal (FMV) in St-Hyacinthe. No restriction sites were available + or – 100 bp of where the 10xHis tag needed to be inserted. The tag also needed to be inserted after MBP’s (Maltose Binding Protein encoded in pMAL) signal peptide cleavage site to ensure detection after protein expression. We designed the mutagenesis primers and a complete protocol for the researcher. We used the Transgen Biotech’s Fast Mutagenesis System strategy to perform the Insertion by Site-Directed Mutagenesis. The Fast Mutagenesis System utilizes a partially overlapping primer design, which enables semi-exponential PCR amplification. Also, the mutation/insertion is inserted in the middle of the forward primer and at the extreme 5′ end of the reverse primer, making the PCR reaction with 2xTransStart FastPfu Supermix easier for high-fidelity DNA polymerases. The PCR product is then treated with DMT (Dpn I) restriction enzyme to digests methylated template DNA, then transformed into DMT Chemically Competent Cells. All reagents are either included in the Fast Mutagenesis System or can be bought separately. The pMAL vector encodes for MBP (Maltose-Binding Protein). pMAL-STb codes for a MBP-STb fusion protein enabling the researcher to express and purify STb in heterologous cells. For extra detection, the researcher wanted to add a 10xHis tag and use RevMAb’s 6xHis or 10xHis Monoclonal antibody for detection. MBP contains a signal peptide in its N-terminus. In order to keep the 10xHis tag intact following signal peptide cleavage, we designed the insertion to be targeted after the signal peptide cleavage site (black arrow). 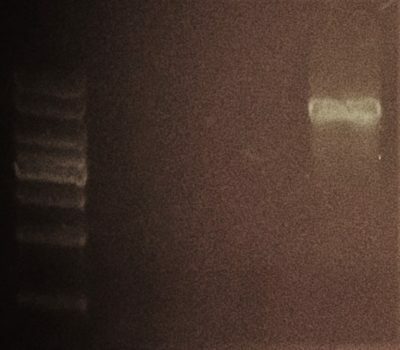 10 ul of the PCR reaction was loaded on a 0.8% agarose gel. pMAL-STb plasmid size is approximately 6.35 kb. Our DNA staining dye retards DNA migration when a large amount of DNA is loaded on the gel. More DNA means more molecules interact with the dye and we observe slightly higher band sizes. We therefore estimate that the amplicon is of the correct size.